Are you a scientist at the leading edge of biological discovery? Then join Bioline at the Analytica International Trade Fair in Munich, April 1-4, 2014. Visit us on stand 516 in Hall A3 to explore our research solutions for gene expression and genotyping studies. Discover how our innovative products help you to achieve better and more accurate results. T his year we’ll be showcasing our new products SensiFAST™ cDNA Synthesis Kit, the unmatched MyTaq™ Blood PCR Kit, and the latest addition to our range, EPIK™ Kits for Epigenetics research and analysis. We'll be hosting live talks on the stand on all four days of the event, covering gene expression and cDNA synthesis, high-sensitivity qPCR, Bisulfite PCR, and all the latest innovations in Direct PCR. 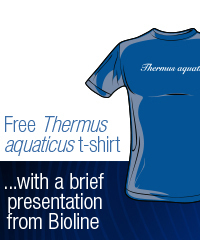 Attend one of our talks most suited to your research, find out why Bioline is the perfect partner for your research, AND receive a free Bioline T-shirt! We very much look forward to meeting with you at Analytica 2014!